Even though I have lived in Hawaiʻi my whole life, like so many locals, there are many things that are published in the tourist books that I have never done. I have never been to Mānoa Falls, I hiked Diamond Head only once in my life in elementary school and I didn’t visit the Arizona Memorial until college. 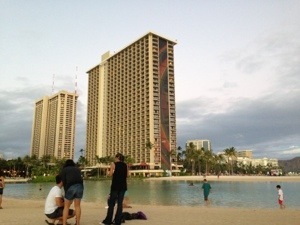 Last night, I crossed off Friday night fireworks at the Hilton Hawaiian Village off my list. 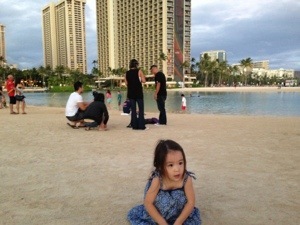 Keao and I had a rare Friday night off so we headed to Waikīkī with the girls to see the festivities. When we got there two things surprised me. One, it was really crowded with both locals and tourists and two, we were really close to the fireworks. For the price (free), it was a great show. I read online that some people thought it was too short but really for a free show what do you expect? Truthfully I didn’t think it was short at all but then again Slugger got scared by the big booms so I know it was definitely long enough for her. All in all, it was a very nice evening. There was plenty of seating at the lagoon and except for the two dollars I paid for parking, the price was great! It was a perfect way to spend a Friday evening.